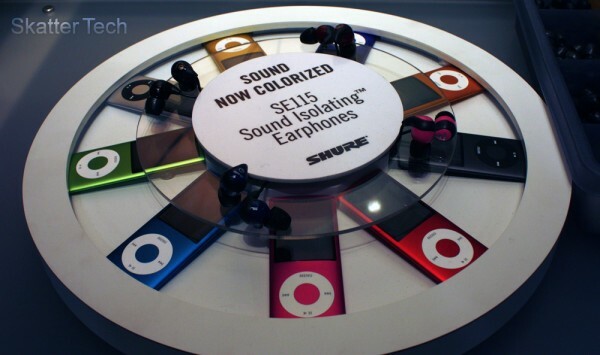 During the Consumer Electronics Show, Shure announced a new set of headphones, the SE115. The series is their most affordable earphones to date, with a retail price of $99. Although these earphones are on the lowest-end of their lineup, they offer an incomparable listening experience versus most generic earphones that are included with most devices. The headphones are available in Blue, Pink, Black and Red to match different portable audio players. Shure has also packed more bass into these earphones will shrinking down the size of the unit. The earphones help eliminate background noise too help fully experience whatever you might be listening too. As always Shure provides a kit with a variety of earpieces to ensure that the buds comfortably fit into your ear canal. The earphones have a modular cable which can extend from just 18 inches to 54 inches with the extension. Shure provides a 2 year limited warranty on these earphones, so rest assured that if they happen to fail or cause problems, you’ll be able to have them replaced. The headphone jack is a standard 3.5mm pin, which will fit into any standard computer, laptop, cd player, or digital audio player. The earphones will become available for purchase in Spring 2009. Although the expect sale price is $99, it should be available for cheaper through many retailers. We’ll be getting a unit to review as soon as we can, so check back for a full review! Meanwhile checkout our review of the Shure SE110 and the SE210. There is no doubt about it’s supremacy but it would have been better if it gettable at an affordable price. I have the new iPhone 3G S. i really love it. if you are interested check out my blog i recently started on. if possible look it over and comment on something with some tips you may have to offer me, thanks in advance!